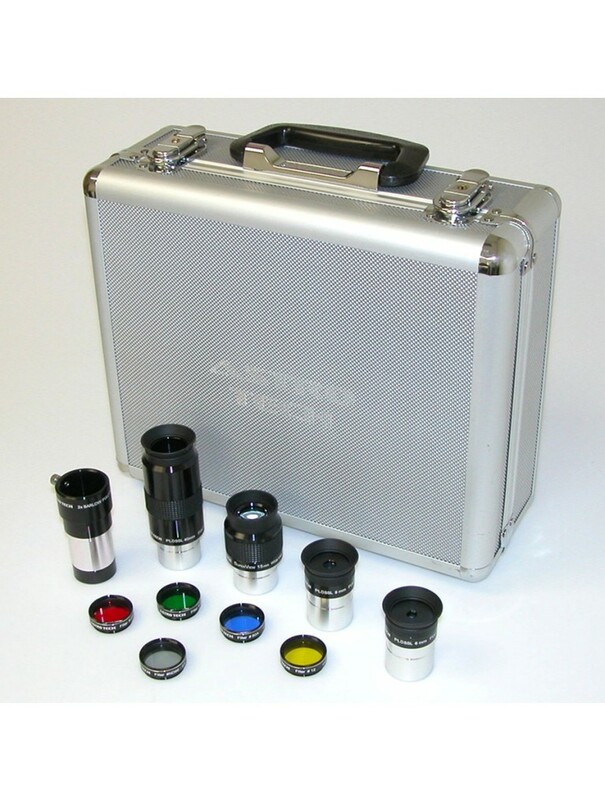 This Astro-Tech accessory kit consists of ten 1.25" visual accessories (eyepieces and filters) that will get you started observing right with your new telescope, no matter what brand scope you buy . . . 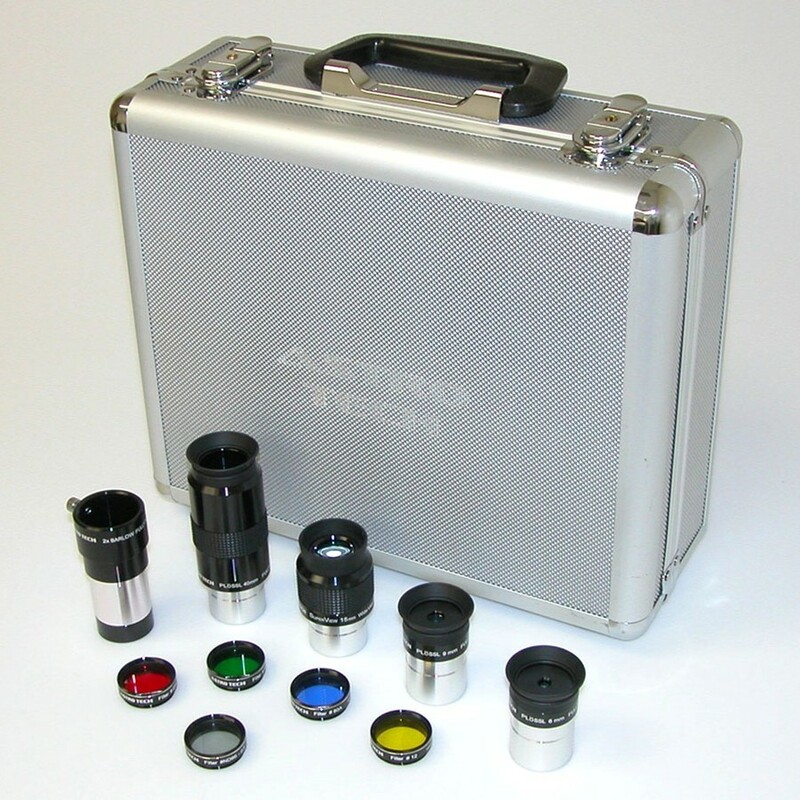 This Astro-Tech 1.25" accessory kit includes ten 1.25" Astro-Tech visual accessories specially chosen to get the most out of small to medium size telescopes - from a 66mm refractor to an 8" to 9.25" catadioptric. 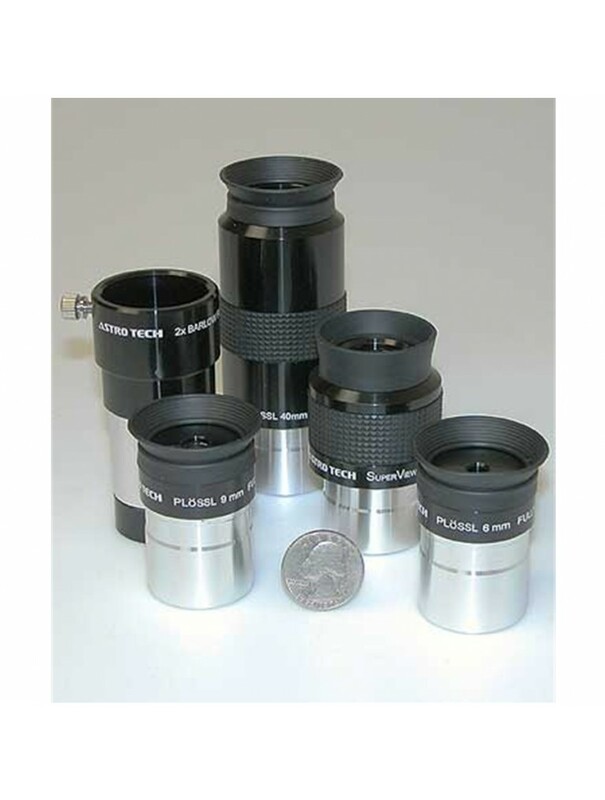 Unlike competitive kits that supply only a 50° apparent field Plössl for their medium focal length eyepiece, this Astro-Tech kit gives you a fully multicoated 1.25" four-element Astro-Tech 15mm SuperView eyepiece with an apparent field of view of 68°. 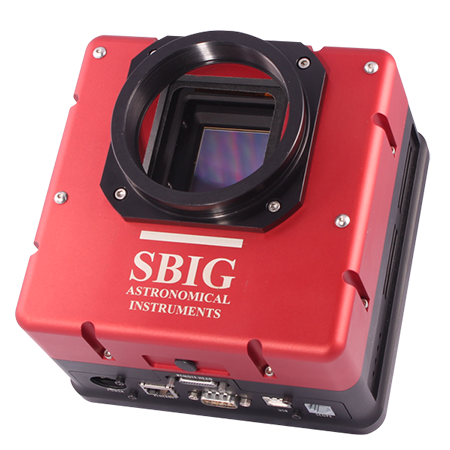 It provides an exceptionally wide and dramatic field for observing nebulas, open star clusters, and galaxies. The Astro-Tech 15mm SuperView weighs 3.4 ounces and has a good 11mm of usable eye relief. The Astro-Tech SuperView has a soft rolldown rubber eyecup to shield your eye from ambient light and improve contrast. It has dust covers for both ends of the eyepiece. Its chrome barrel is threaded for 1.25" filters, and a safety groove is machined into the barrel. This engages the thumbscrew or compression ring of your star diagonal to keep the eyepiece from falling in the dark should the thumbscrew accidentally loosen during use. 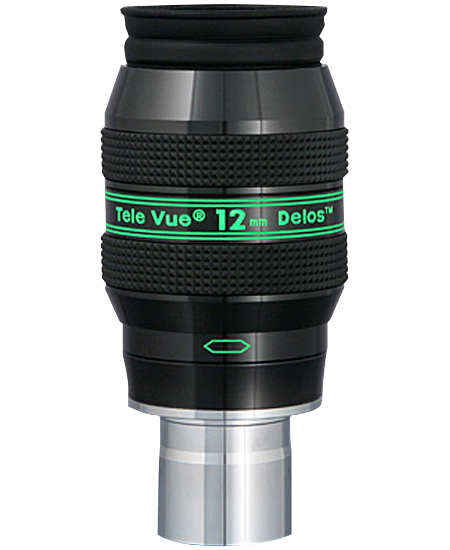 You also get three fully multicoated 1.25" four-element Astro-Tech Plössl eyepieces, in focal lengths of 6, 9, and 40mm. Like the SuperView, each has a soft rolldown rubber eyecup and dust covers for both ends of the eyepiece. Their chrome barrels are threaded for 1.25" filters, and a safety groove is machined into each barrel. The 40mm Astro-Tech Plössl has an apparent field of view of 45°. 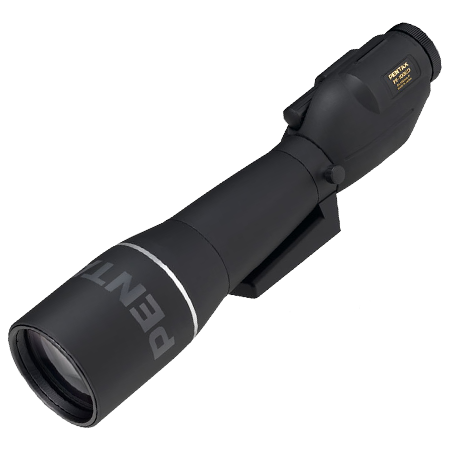 It provides the widest field and brightest image possible from a 1.25" eyepiece with any scope down to an f/6 focal ratio. 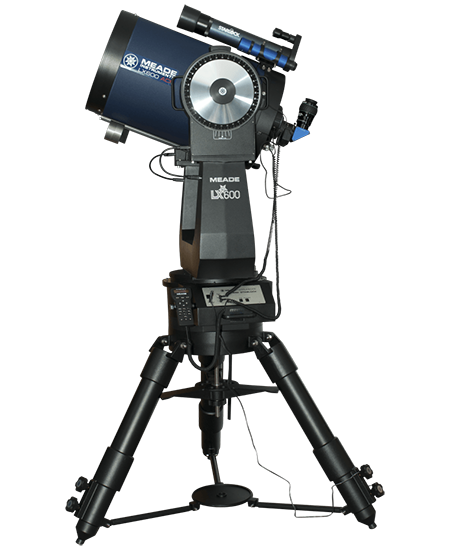 Competitive kits usually provide a 32mm eyepiece, which has a smaller exit pupil and is only about two-thirds as bright on faint objects as the 40mm in this Astro-Tech kit. The Astro-Tech 40mm Plössl weighs 5 ounces and has a long 18mm of usable eye relief, for virtually unvignetted views when wearing eyeglasses. The 6mm and 9mm Astro-Tech Plössls each have a 52° apparent field. 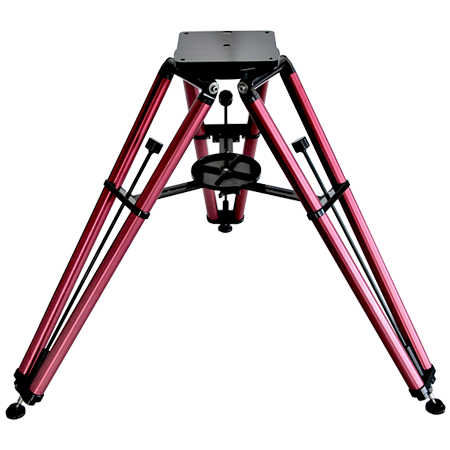 They are designed for high contrast/high power lunar and planetary observing, resolving globular clusters, and splitting close binary stars. Each weighs 1.5 ounces. 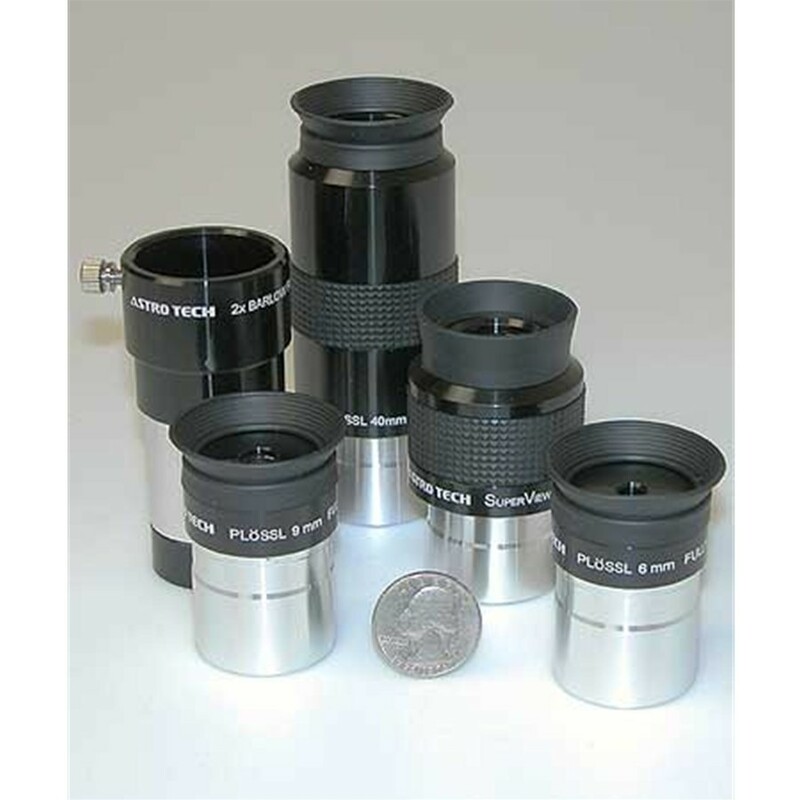 The 6mm eyepiece has a short but still very usable 3mm eye relief, while the 9mm has a longer 6mm eye relief. 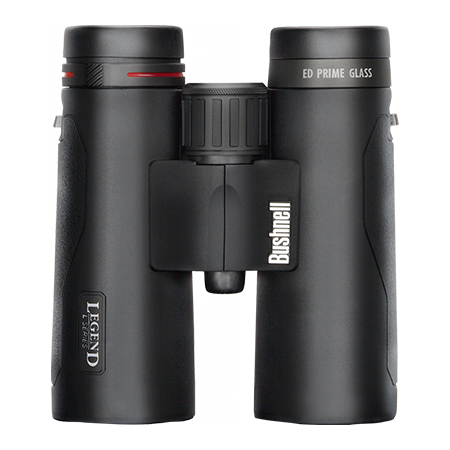 The supplied fully multicoated 2x Astro-Tech 1.25" achromatic Barlow effectively doubles the power of each eyepiece without reducing its eye relief. The 6mm effectively becomes a 3mm, while the 9mm becomes a 4.5mm. The 15mm SuperView effectively becomes a 7.5mm, while the 40mm effectively becomes a 20mm. 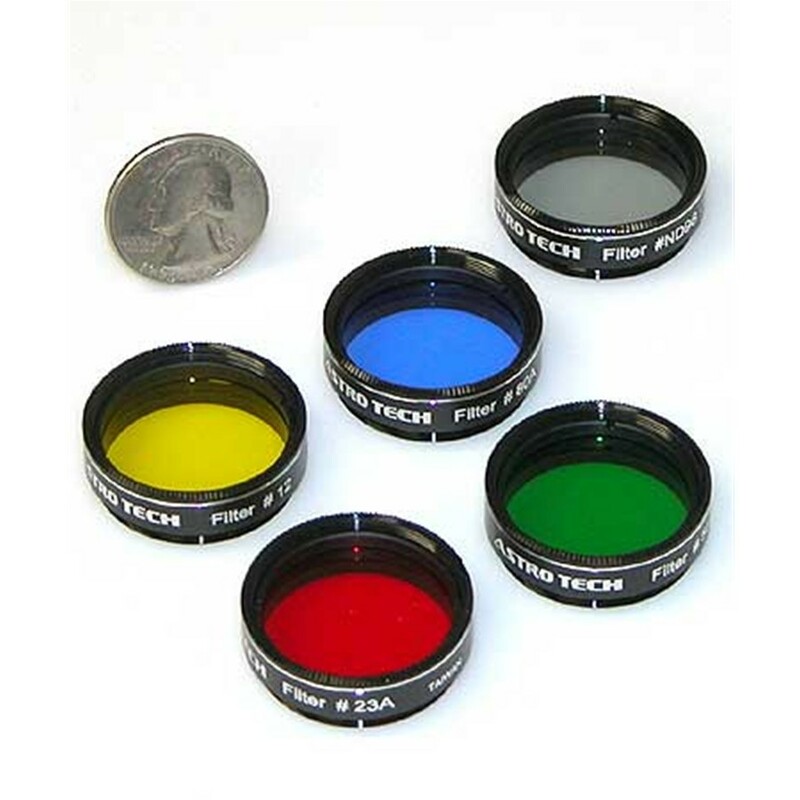 The 25mm or 26mm eyepiece normally supplied as standard equipment with a new telescope effectively becomes a 12.5mm or 13mm when used with the Astro-Tech Barlow. Note that there is no duplication of magnifications with any of these eyepiece/Barlow combinations. The Astro-Tech Barlow weighs 2 ounces. 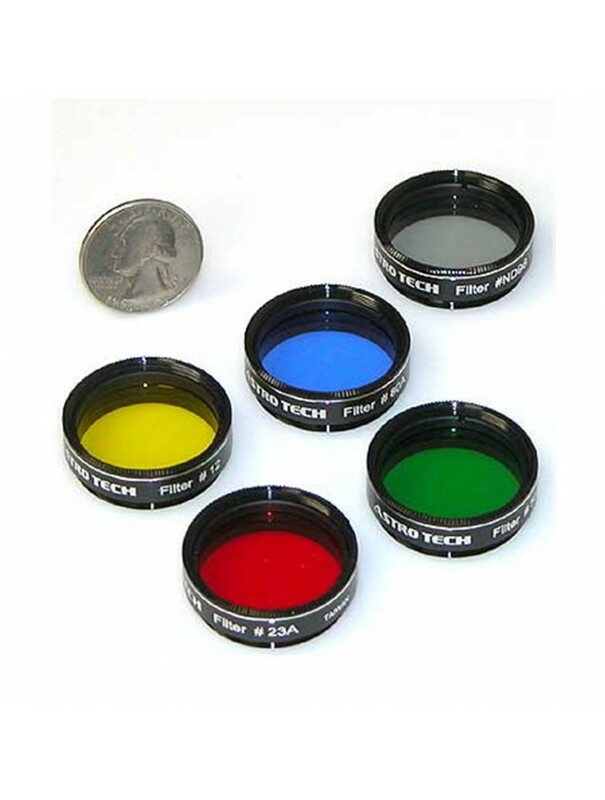 To bring out surface structure and details in lunar and planetary observing, you get the following four 1.25" eyepiece color filters: #12 medium yellow, #23A light red, #56 light green, and #80A medium blue. A specification sheet provided with each kit describes the effect of each filter on the various planets. You also get a 1.25" #ND-3 neutral density Moon filter to cut down the glare of our nearest celestial neighbor without affecting the color and increase the contrast of its features. The 50% light transmission filter is also useful for splitting close binary stars, as it will reduce the glare of the brighter star of the pair so that the dimmer component isn't overwhelmed by the light of the brighter one. Finally, all the accessories come in a locking aluminum-frame 12.5" x 10.25" x 4.75" hard carrying case with a die-cut foam interior to keep them conveniently handy in the dark. 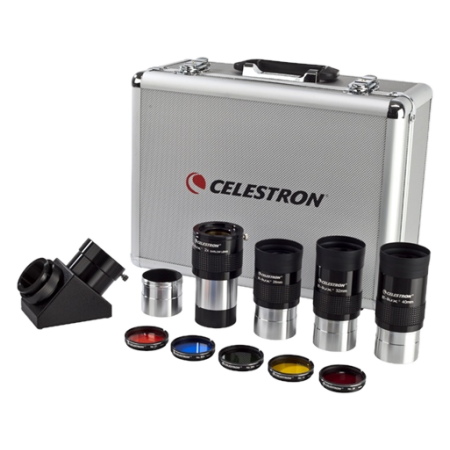 The case also has room to store three other optional 1.25" eyepieces (the standard eyepiece supplied with your scope, for example), plus three other optional 1.25" filters (such as nebula filters).